Also captured some nice "B-roll" footage of the trove. Typecast on Adobe Rose, the Royal QDL, onto the backside of the recently acquired 4-3/8" wide thermal paper. About perfect width for blogging with elite-sized font. Today I spent hours making test exposures with my various video cameras, trying out various settings, then uploading the footage repeatedly to my computer and viewing full-screen on my monitor. I'm trying to optimize my video quality. I keep wanting to use the little Canon Vixia 800 camcorder, as I like the form factor and it has good image stabilization. But the video quality just doesn't keep up. Some of the footage in yesterday's video was shot with the Canon and I wished I'd used one of the Lumix cameras instead. The el cheapo "Ape Man" Go Pro knockoff camera is really small, but has a fish-eye field of view and rather cruddy image quality. I wish someone like Go Pro made one with a flip-up screen and external mic input for vlogging. And better image quality, like the Sony RX0. The older Panasonic GH-3 has the best 1080P files of the four cameras, but it doesn't have as good of autofocus or dynamic range. The even older G5 has the best colors on its LCD screen but the results don't hold up once imported to the computer. The newer G7 has the best dynamic range and auto focus but the colors tend to be a bit orange, and its 1080P isn't as good as the GH3. But it also has cropped 4K, so that's what it's primary use is for. As for lenses, the 14-42 kit lens has optical image stabilization but its F/3.5 maximum aperture is a bit slow for dim lighting; whereas the 14/2.5 is faster in low light but lacks OIS. I probably need to bite the bullet and fork over some big bucks for a constant aperture stabilized f/2.5 pro lens. The OIS isn't important for stationary shooting in my office studio, but for moving-around scenes, like this typewriter shoot, I really need better stabilization while maintaining a fast aperture. I don't think Santa will be dropping one down the chimney any time soon, however. Plus, our gas stoves' chimneys are rather narrow. Santa's a big boy, last time I checked. Oh, well. As George Carlin once said, "you can't have everything - where would you put it?" 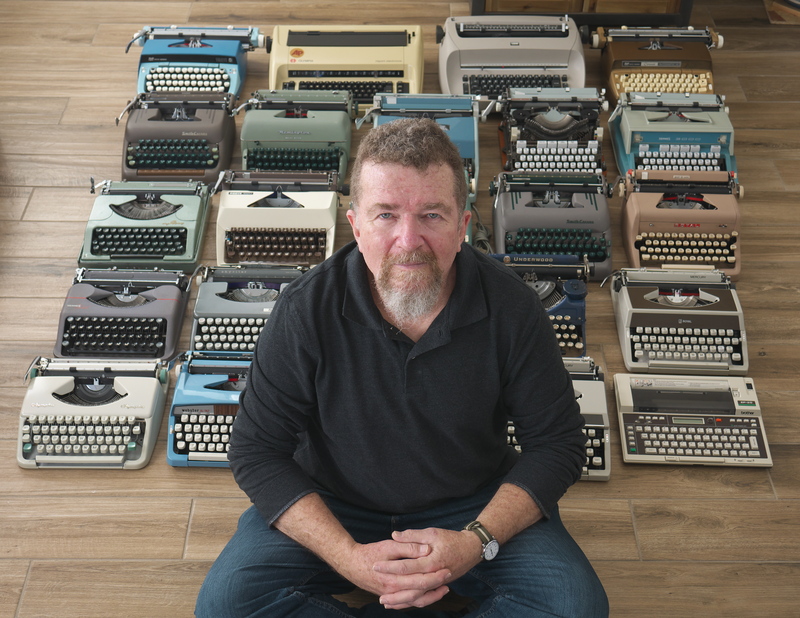 Probably next to all the typewriters. Now I have to work on Christmas cards. Yes, I'm running late again. I want to type up some letters to go along with them. Wish me luck. Nice collection. 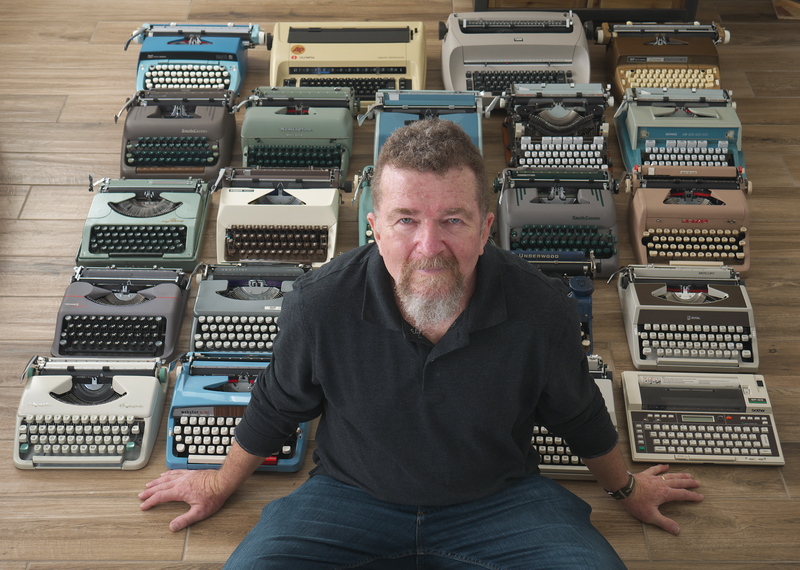 It is good to see you along with all your typewriter family. 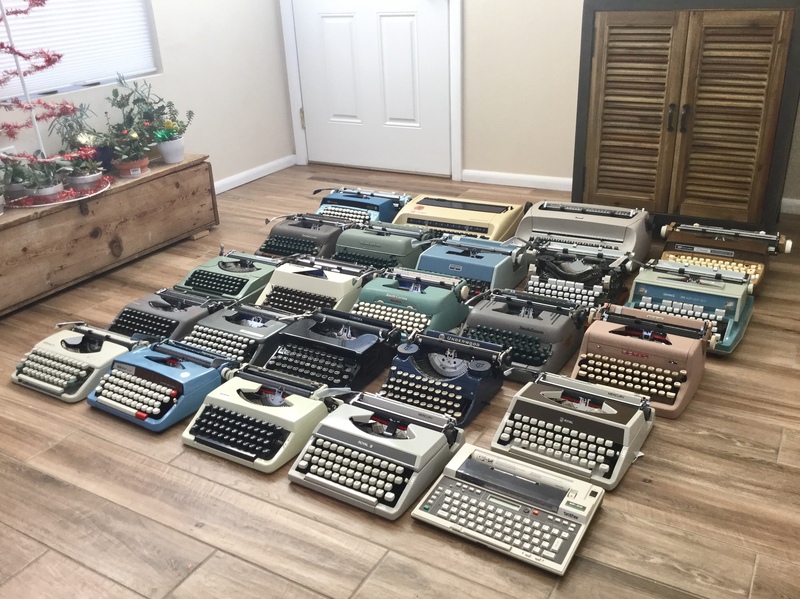 I am so glad to see that you have more typewriters than I do. It gives me some bit of defense when my wife starts wondering if I have too many. That EP machine doesn't look so out of place! I love the second picture above. You have a nice collection, Joe!